"666" - The Mark Of The Beast! So, how can that be??? I mean how in the world can Cross Ministries – a radically religious roadside park – be involved with, or have anything to do with, the dark and deadly dynamic trio of “Revelation 13”? I mean, after all, it’s only through the combined efforts of these three – Satan, the Antichrist, and his false prophet – that millions will be seduced into damming their souls to an everlasting fiery torment in the burning fires of Hell by taking the mark of the beast. Now ain’t that holy? Well, I don’t think so! Because you see five (5) of those thirteen (13) stations (noted with an asterisk *) aren’t even Scriptural – the Roman Catholic Church made them up! They call it “tradition”, but the Almighty calls it a lie! And you see it’s this same Roman Catholic “deception” in the “stations of the cross” that’s designed to draw their faithful followers deeper into the darkness of the occult and further away from a true saving relationship with Jesus Christ. So having said that, please allow me to explain. Indulgences are nothing short of “witchcraft”! A few years ago, as Mel Gibson was rediscovering and renewing his Catholic faith, he purchased a library from a closed nunnery containing hundreds of books. Mel claims that as he was reaching for a book on the library shelf a supernatural intervention caused another book to "miraculously" drop into his hands. And that "miracle" book - not the Bible, not the Gospel - was the inspiration of Mel Gibson's "The Passion Of The Christ". The book was "The Dolorous Passion of Our Lord Jesus Christ according to the Meditations of Anne Catherine Emmerich" and Gibson claims that just like "magic" this book opened up a whole new world. "'Amazing images,' he said. 'She supplied me with stuff I never would have thought of". So just who is this Anne Catherine Emmerich, the mysterious script writer of The Passion? Anne Catherine Emmerich was a famous, mystic, Catholic Nun who possessed some very unusual abilities. Anne was born on the feast of the Virgin Mary's own nativity: September 8, 1774 in Westphalia, Germany. She became a nun of the Augustinian Order at Dulmen. Emmerich began having supernatural visions very early in her life. By the age of four she prayed for three hours a day while being physically visited by her guardian angel. Even at that early age people around her described a "mysterious power that emanated from her." Emmerich was found frequently practicing the occult art of levitation. Many times when she entered a room, she was clearly seen levitating above the ground. She also practiced the occult art of astral projection, claiming to "bilocate" to various places. Astral Projection is the "physic ability" when the soul leaves the physical body and travels beyond space and time. During her mystic astral projections, she claims to have watched the actual execution of King Louis XVI, and visited Marie Antoinette, queen of France, in prison. Some times these astral projection trips actually took her into purgatory to view the tortured souls. Of course, the Bible does not teach purgatory. Emmerich experienced about every satanic supernatural and occult practices known. Emmerich also bore the actual, physical wounds of Jesus Christ, called the Catholic mystic stigmata, where the wounds of Christ supernaturally appear on the hands, feet and head. According to supposedly verified medical reports, her supernatural stigmata wounds were half an inch in size and found in her hands, feet, side, head and bled profusely, especially on Fridays (the Catholic's erroneous day of the crucifixion). At times the blood flowed so heavy from the supernatural stigmata wounds, it would completely soak the bandages and freely flow on the ground. According to various sources, this was all verified by medical doctors. One physician who examined Emmerich said, "There can be no question of imposture in this case. The wounds speak for themselves, at least to a man of science. To ascribe them to natural causes such as imagination, induction, analogy, or similar causes, is simply impossible." According to her biographers, during the last 12 years of Anne's life she ate no food except the bread and wine of the Holy Eucharist. In other words, she supposedly lived for over 12 years on nothing but the Catholic Eucharist or Mass. To put it bluntly, Anne Catherine Emmerich was a very spiritually disturbed lady. Emmerich experienced common occurrences of supernatural visions. During these visions she claims to have "seen" the creation of Heaven, the fall of the angels, the creation of the earth, paradise and many other such scenes. During these demonic visions she also claims to have "seen" the actual crucifixion of Jesus Christ take place. Anne wrote a book titled, The Dolorous Passion of Our Lord Jesus Christ from these visions. And according to Mel Gibson, these demonic crucifixion visions, called the Dolorous Passion, became the "supernatural imposed" script and inspiration for The Passion - not the Gospels. This was the book that "supernaturally" fell into his hands that became the script and inspiration for The Passion Of The Christ. 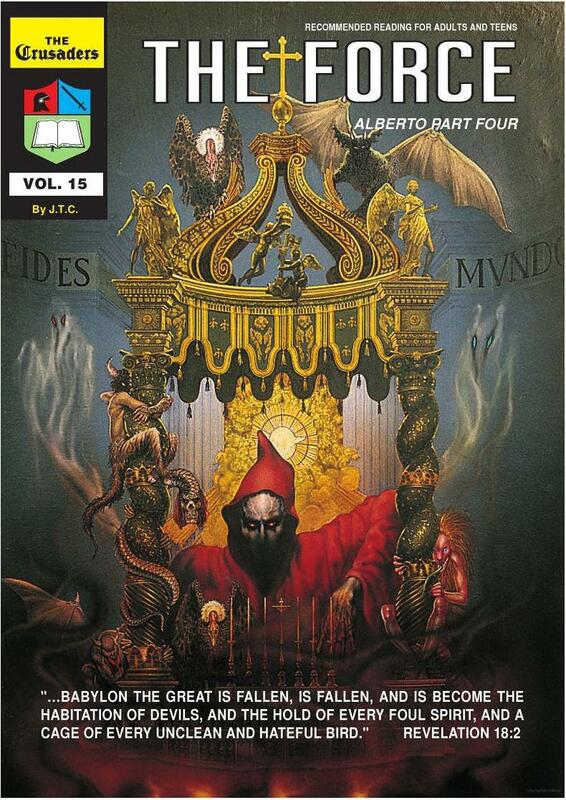 So…Anne Catherine Emmerich was a very good Catholic because she experienced almost every satanic “supernatural and occult” practice that the Devil has to offer! It’s called “The Force!” It’s the power behind the Roman Catholic Church, and his name is Satan! Now to help you understand how all this “hoodoo-voodoo” stuff takes place through the “stations of the cross”, let’s take a close look at the photo on the left: “God’s Ten Commandments”. 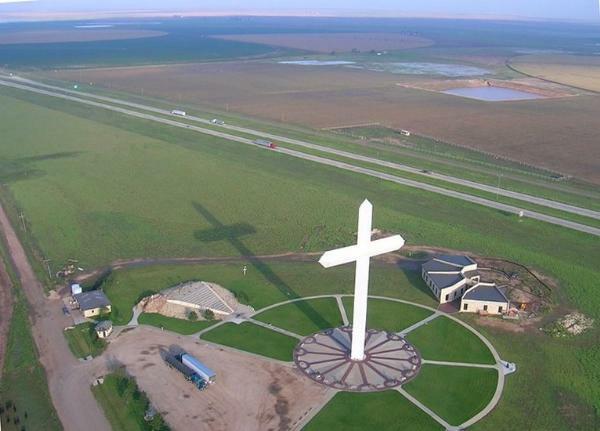 You see this is just another one of the items on display at the Cross Ministries roadside theme park in Groom, Texas, and, without a doubt, it’s “Roman Catholic” to the core. I mean regardless of what the Roman Catholic Church might say, the fact still remains that God Almighty is still God! And He says that whenever a person or group of people pray long enough and hard enough to a lifeless statue (idol), strange things will start to happen through that same statue (idol), and it's definitely not because of the Power of God working through it! In fact in his book "Biblical Demonology" Merrill F. Unger writes the following concerning Psalm 96:5 and the original Hebrew word "'ellim" that the word "idols" was translated from: "This is the classic passage identifying demons with idols, and suggesting demonism as the dynamic of idolatry. Hebrew 'ellim, the plural of the adjective meaning 'of naught, empty, vain' shows plainly the idols are 'mere nothing' non-realities. The demons behind them are the real existences." So you see even though the Catholic Church might profess that images are only tools to "honor Jesus, His mother, and the saints", the resulting supernatural manifestations that actually take place through these same statues (idols) are not through the Power of God Almighty! It's what's commonly called "demon worship" - promoted by the Roman Catholic Church I might add - and the resulting signs and wonders that follow are only made possible through the demonic spirits empowered by the worship of people. So do you get the picture? 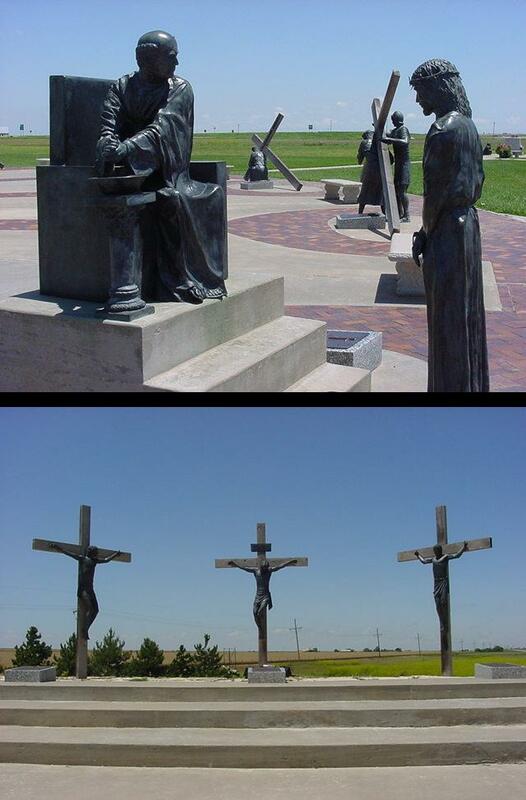 Can you “see” all those hideous looking demons crouched behind the “stations of the cross” receiving the prayers of the “faithful” to the bronze figures? The Force! I mean do you now understand why the Roman Catholic Church must have the idols in order to do their witchcraft? 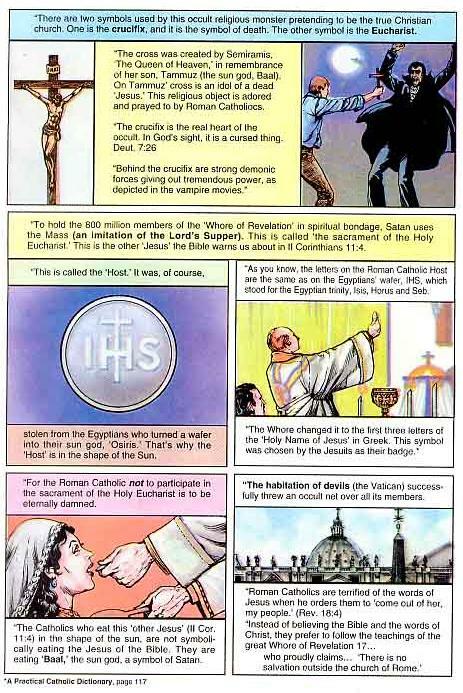 The Roman Catholic Church is absolutely and positively demonic through and through! And having said all that, let me now give you a glimpse of the Cross Ministries’ Holy Bible. 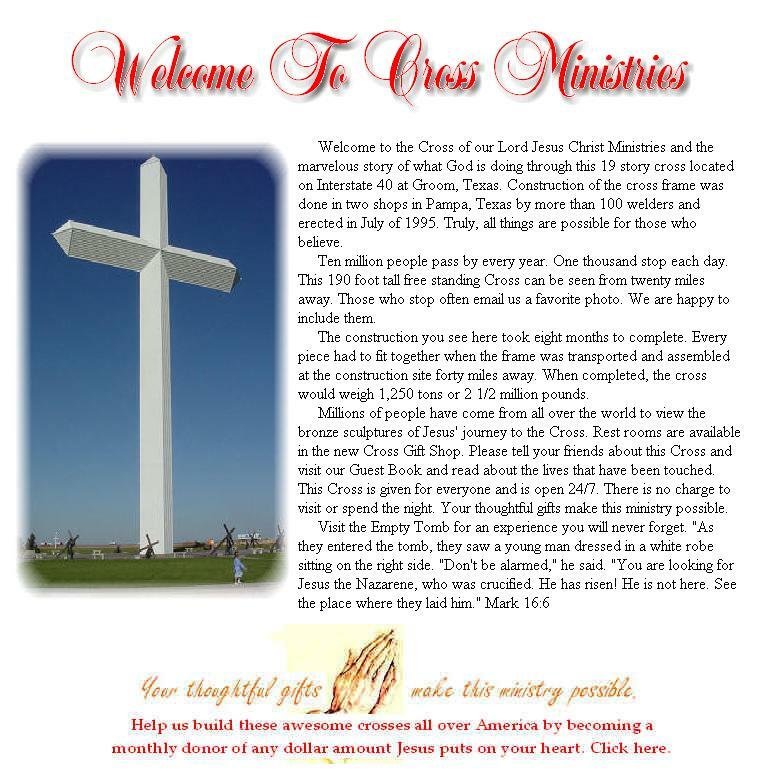 Because on the home page of their Web site (http://www.crossministries.net/index.htm) you’ll find a “Holy Bible” link at the bottom (http://www.drbo.org) that will take you to an online reading of the Douay-Rheims Catholic Bible, which, might I add, is one more perverted version of God’s Holy Word . Additional Reading: Introduction; Preface 1989 Edition; Catechism of the Bible; The Church or the Bible; The One True Church; The Church & Her Enemies; Against The Reformers; Dr David White's Conversion; Pope Leo's Encyclical; Latin Mass Locations; Christian Modesty. Devotions: Sacred Heart of Jesus; Immaculate Heart of Mary; The Rosary. The Only Church That Christ Established Is The Catholic Church. "He that believeth and is baptized shall be saved, but he that believeth not shall be condemned." [Mark 16:16]. The Only Church That Satan Established Is The Catholic Church. …But there are other reasons still, why Protestants cannot be saved. Jesus Christ says: "Except you eat the Flesh of the Son of man, and drink His blood, you shall not have life in you." (John 6: 54.) Now, Protestants do not receive the Body of Our Lord, because their ministers are not priests, and consequently have no power from Jesus Christ to say Mass, in which, by the words of consecration, bread and wine are changed into the Body and Blood of Christ. It follows, then, clearly that they will not enter into life everlasting, and deservedly so, because they abolished the holy Sacrifice of the Mass; and by abolishing that great Sacrifice they robbed God the Father of the infinite honour which Jesus Christ renders Him therein, and themselves of all the blessings which Jesus Christ bestows upon those who assist at this holy Sacrifice with faith and devotion: "Wherefore the sin of the young men (the sons of Heli) was exceeding great before the Lord, because they withdrew men from the sacrifice of the Lord." (1 Kings 2:17.) Now, God the Father cannot admit into Heaven these robbers of His infinite honour; because if those are damned who steal the temporal goods of their neighbour, how much more will those be damned who deprive God of His infinite honour, and their fellow-men of the infinite spiritual blessings of the Mass! Now did you get that? The Roman Catholic Church says that Protestants – those who protest the Roman Catholic Satanic Church – cannot be saved because they don’t “eat the flesh” and “drink the blood” of the Roman Catholic priests’ freshly “sacrificed” Jesus. Talk about satanic! And of course that’s one very good reason we wrote a series of messages on this abominable practice entitled “Vampires In The Church”. Check it out at http://www.fmh-child.org/S3.15.98.html! 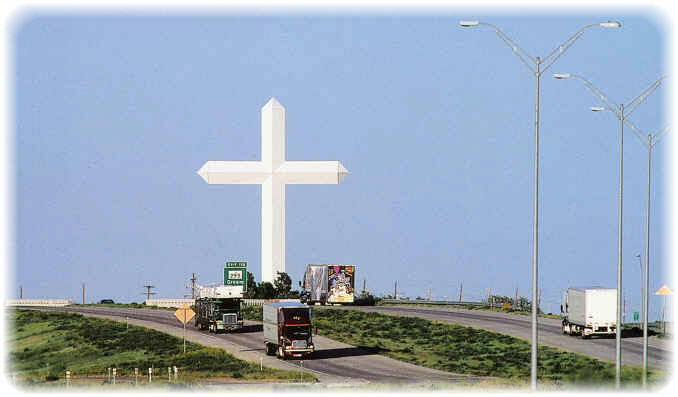 And there you have it; the Truth about the Cross Ministries and their little roadside theme park. How very deceptive can Satan be! In fact it was right about the time the Lord gave me the Scripture and title for this expose – “Revelation 13” and “666 The Mark Of The Beast” – that it all started to make sense. Because, you see, soon and very soon the Antichrist of the Roman Catholic Church will take control of the world and demand his mark be taken by all. So what better place for the traveling masses to get their mark than a convenient Interstate roadside park?